Tinting is a safe way to enhance your look by dying the eyelashes or eyebrows. Using vegetable dye the area is carefully prepped and delicately tinted. The result will be fuller and more defined lashes aand brows. Try a tint and make your already beautiful eyes really pop. Time required: 20 minutes. 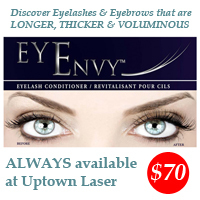 Eyebrow and Eyelash Tinting usually lasts about 3 weeks.